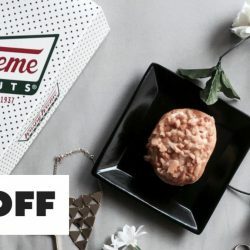 31 Jan 2019 Krispy Kreme: For 1 Day Only, Get 12 Original Glazed Doughnuts for only $12 (UP $31.20)! 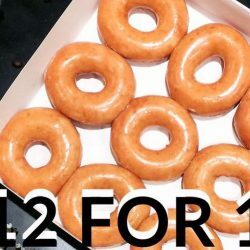 Krispy Kreme has heard you and is bringing their 12 for $12 promo back! 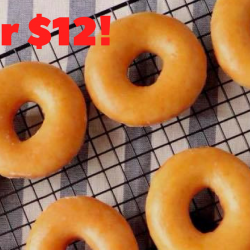 For one day only on 31 Jan 2019, get 12 Original Glazed doughnuts for only $12 (UP $31.20)! Promo starts at 12pm at Suntec City, Changi Airport T2, Income At Raffles and Northpoint City. 12 Oct 2018, from 12pm Krispy Kreme: Enjoy 12 Original Glazed Doughnuts for $12 at 4 Locations! Krispy Kreme's 12 original glazed doughnuts for $12 offer is back! This time you can enjoy the offer at 4 locations! On 12 Oct 2018, enjoy this promo at Suntec City, Changi Airport T2, Jurong Point & Northpoint City from 12pm. 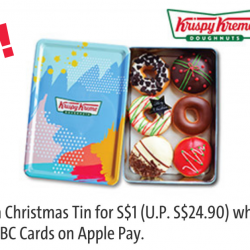 To be eligible for this promotion, individuals must (1) Like their Facebook Page (“Singapore Krispy Kreme”) AND(2) Instagram Account (@krispykremesingapore). 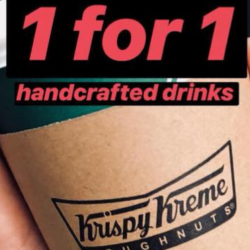 Till 5 Oct 2018 Krispy Kreme: Enjoy 1-for-1 Handcrafted Drink! Exclusively for Krispy Kreme Singapore fans, enjoy 1-for-1 handcrafted drink at Krispy Kreme Singapore stores from now till 5 October 2018! Drinks include latte, mocha, tea, hot chocolate and more. Remember to like their FB page here! 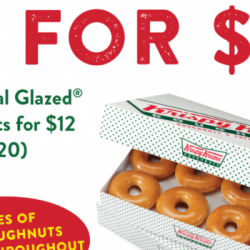 Krispy Kreme's 12 original glazed doughnuts for $12 offer is back! On 1st July 2018, enjoy this promo at Great World City and Northpoint City from 12pm! All you need to do is to follow their FB and Instagram page. On 8 June 2018, Friday, Krispy Kreme will be running an exclusive 12 Original Glazed Doughnuts for $12 promotion at Suntec City! Only $1 each! Don't miss it! Till 16 May 2018 Krispy Kreme: 12 Original Glazed Doughnuts at only $12 via Honestbee App! 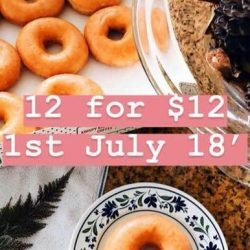 From now till 16th May 2018, purchase 12 Original Glazed doughnuts at just $12! Whilst stocks last, exclusively available via the honestbee app. Krispy Kreme: Enjoy 12 Original Glazed Doughnuts at Just $12 (UP $2.95 Each) on 12 October 2017! 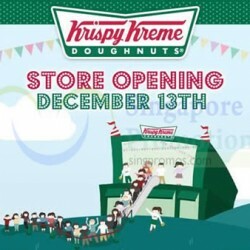 HAPPY 4TH BIRTHDAY TO KRISPY KREME SINGAPORE! In celebration of their 4th year in tropical Singapore, they are having an exclusive ONE-DAY-ONLY promotion; enjoy 12 of the World Famous Original Glazed Doughnuts at JUST $12 (No Strings Attached)! Available only on 12th October 2017, at ALL outlets islandwide! Don't let your friends say bojio; share this post with them NOW! Enjoy Krispy Kreme's delicious doughnuts from the comfort of your bed by ordering through Foodpanda! 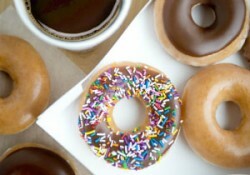 From now till 31st March, use coupon code for $15 off a minimum order of $30 of Krispy Kreme Doughnuts! Till 31 Dec 2016, unless otherwise stated Maybank: 1-for-1 Dining Deals and More Including Krispy Kreme! 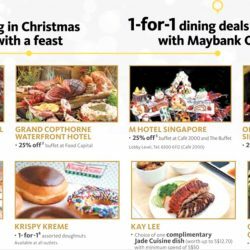 Ring in Christmas with a feast with Maybank's 1-for-1 dining deals and more! 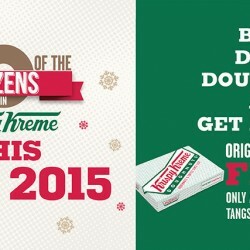 Enjoy up to 25% off at selected buffets, 1-for-1 assorted doughnuts at Krispy Kreme and many other deals now! With doughnuts that melt in your mouth, celebrate Krispy Kreme's 79th Anniversary tomorrow on 13 July! 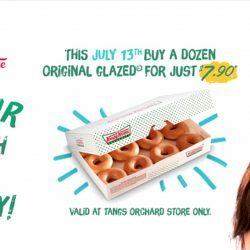 Purchase a dozen Original Glazed doughnuts and get the second dozen at just $7.90! Available at TANGS Orchard store only. While stocks last. There're 10 more days before 12.12.2015. This is a special day for Krispy Kreme that's known as the Day of Dozens, because each purchase of any dozen doughnuts gets you an Original Glazed® doughnuts dozen on the house! Only available at Krispy Kreme Tangs Orchard Store. If you have not tasted Krispy Kreme’s Original Glazed doughnut, you have been missing out a lot! Eat it while it’s still warm and the doughnut just melts in your mouth. 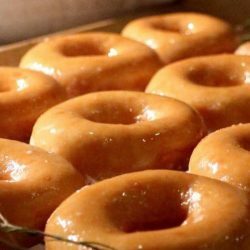 You will never want to eat other doughnuts again, trust me! Krispy Kreme brings you Great World City Opening Special. Enjoy! Krispy Kreme will be celebrating Krispy Kreme's 77th Birthday on 11 July 2014 with a special promotion. 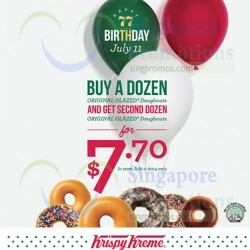 Buy 2nd Dozen Doughnuts at only S$7.7.